Not even a word from Bob Gibson could prevent Rick Camp from surrendering the hit that propelled the Cardinals to their first National League pennant in 14 years. The Cardinals completed a three-game sweep of the best-of-five 1982 National League Championship Series, beating Camp and the Braves, 6-2, in Game 3 at Atlanta. The victory vaulted them into the World Series for the first time since 1968, when Gibson was their ace. In Cardinals history, Camp is better recalled for the second-inning meltdown in the deciding game of the playoff series. After Camp retired the Cardinals in order in the first, Keith Hernandez led off the second with a single and Darrell Porter walked. Camp thought he struck out Porter on a pitch instead ruled a checked swing. George Hendrick singled, scoring Hernandez and advancing Porter to third, and St. Louis led, 1-0. On Camp’s first pitch after Gibson’s visit, McGee tripled to right-center, scoring Porter and Hendrick. Instead, Camp faced eight batters, yielding four runs, four hits and a walk. 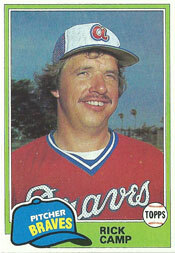 In a nine-year career with the Braves (1976-85), Camp made 28 appearances against the Cardinals, posting a 4-4 record and 4.25 ERA.